2017 Anxiety pangs & keeping them at Bay! Eshl Sparks, Traveller, Blogger, Foodist by choice & an Engineer by profession. Bidding sweet farewell to the year 2k17. Oh so here comes 2017 to an end and I start to feel the anxiousness at the rate of 60 WTFs per minute. Quite sure, i’m not the only one feeling it as the year comes to its beautiful close. Beginning this year many of us stretched up our goal sheet pre-planning, sketching it up and adorning it and somehow at the present hour it looks as if you just finished compiling it. The year went by too fast for us to catch on our targets. Yes, we had numerous things in mind, multiple targets to achieve, various errands to succeed in, bunch of new beginnings to give a start to, loads of tasks to finish and yet here we are by the minute gathering up our things. But not too wrong to say that let bygones be bygones & spread your arms for another new year approaching.And why not edit the same goal sheet and add to it. Nevertheless we always give our best to every day of the year unless you are real pessimist. Never overthink on the complete cue of things you missed or did not achieve, may be its for the best of you or you didn’t work that hard. *wink. Its okay to not feel satisfied for what and how this year went by. Sticking to the very human nature you would have felt the same if you were a wee-bit closer to your aim. Lets not prolong our anxiousness and instead thank god for how beautiful it went by.Let’s numb our anxiety feels for few minutes and throw up some light on how grateful you could be for the year passed. Do not crib about the things you planned for but couldn’t put into realization. Take it as task meant for 2018 instead. Matter of fact is before writing this article i kinda quickly touch base with my own mind to not bad-mouth the year gone by. This is how i manipulated my mind-Think positive & stay grateful to all the minnie-miny details and acquisitions achieved. For they form the base to articulate your bigger dreams. Stay focused & stay optimistic about the coming year that will bring its own set of challenges and happiness. Lets make another resolution this year to not cringe about the failures of last year. Appreciate the best moments, strike off the things accomplished from your goal sheet only to see the leftovers keeping you strong & more willing to achieve them all in this approaching year. Let’s bring our best foot forward with anxiety-free hearts and welcome the new year in good spirits!! 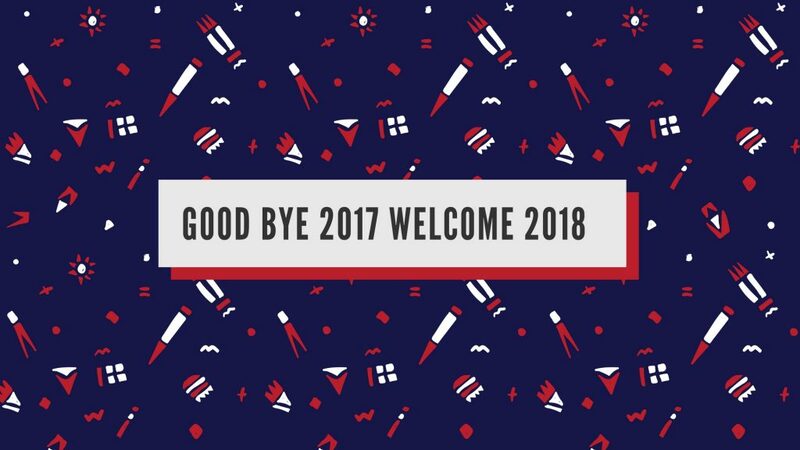 Bid a warm farewell to 2017 & keep your hearts wide open for the coming year. Do not pressurize yourself and keep all your anxiety pangs at bay as this year will bring you more ideas and much opportunities to re-define your resolution list.